Senate Majority Leader Mitch McConnell and Democratic leader Chuck Schumer said negotiations kept going late into the night, with a vote to break a Democratic filibuster on a short-term funding bill scheduled for noon Monday. Under the proposal taking shape, Democratic would agree to a three-week spending measure - until Feb. 8 - in return for a commitment from the Republican leadership in the Senate to address immigration policy and other pressing legislative matters in the coming weeks. But Democrats appeared to be holding out for a firmer commitment from McConnell. "We have yet to reach an agreement on a path forward," Schumer said late Sunday. McConnell's comments followed hours of behind-the-scenes talks between the leaders and rank-and-file lawmakers over how to end the display of legislative dysfunction, which began Friday at midnight after Democrats blocked a temporary spending measure. Democrats have sought to use the spending bill to win concessions, including protections for roughly 700,000 younger immigrants brought illegally to the U.S. as children. Although they initially dug in on a demand for an immigration deal, Democrats had shifted to blaming the shutdown on the incompetence of Republicans and President Donald Trump, seeming sensitive to being seen by voters as willing to tie up government operations over their big to protect immigrants. Sunday morning on Twitter, he called on the GOP-controlled Senate to consider deploying the "nuclear option" - changing Senate rules to end the filibuster - and reopen the government with a simple majority. McConnell has dismissed that option, saying Republicans will welcome the filibuster when they return to being the Senate minority. The White House didn't immediately respond to McConnell's comments. Democrats are facing intense pressure from their base to solve the issue over the young immigrants, and they are skeptical of Republicans' credibility when offering to take up the issue. Whether Trump would back the emerging plan or any later proposal on immigration is an open question. 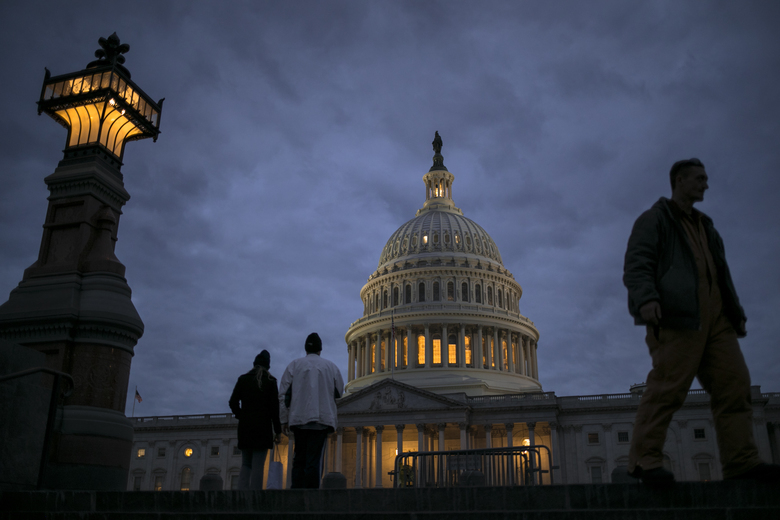 Even if the Senate voted on an immigration proposal, its prospects in the House would be grim. Graham said no deal had been reached by the moderate group because Democrats were not yet on board. "To my Democratic friends, don't overplay your hand," he told reporters. "A government shutdown is not a good way to get an outcome legislatively."